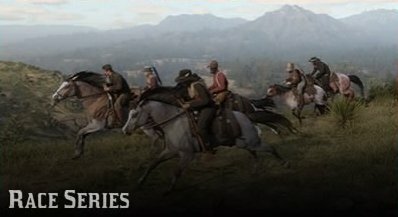 Learn about the Horse Races in Red Dead Online! Check out details on Horse Race rules, courses, tips and tricks, and more. 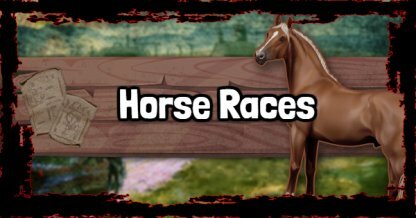 Horse Races will pit you against other online players in races all around the map! The goal is to pass through different checkpoints and get to the finish line. First player to pass through all checkpoints, and through the finish line wins! Horse Races are divided into Lap Races, Point-To-Point Races, and Open Races. Each of these races have their own specific mechanics to win! Lap Races pit you against other players as you complete a set number of laps around a course. The first player to complete the set number of laps wins! Point-To-Point Races will have you traveling through a certain distance between the starting point, and finish line. You will need to keep an eye out for checkpoints to show you where to go! First player to cross the finish line wins! Open Races have scattered checkpoints around the race area, and it is up to you to choose which path to take. The first player to collect all checkpoints and reach the finish line wins! You will be able to race against a minimum of 16, and a maximum of 32 players while playing online. Take on these players and show 'em why this country ain't big enough for the 16 or 32 of you! Checkpoints will be shown on your minimap as yellow blips with the letter "x" on them. Constantly check your minimap to have a general direction of where the next checkpoint is. While racing, your horse will consume stamina. Keep an eye on its stamina as running out of stamina will cause the horse to buck you off! While racing, you will find some barrels along the course. Passing through these barrels will give you different power ups such as guns, extra stamina, and more! If you do not have any weapons on you, you can still punch and kick players off their horses. All you need to do is get near to them, and punch or kick them to make them lose their balance! It is not recommended to engage in combat when playing Open Races. It would be better to use your precious time to go out and collect the remaining checkpoints in order for you to finish the race first!